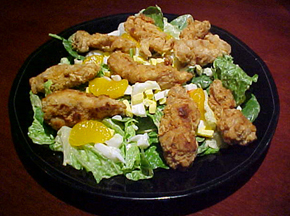 Fresh romaine and spinach leaves make fried chicken a little more “diet-friendly” after the holidays! Carrots and pine nuts add great texture, and mandarin oranges add color and sweetness. Use a dressing of your choice; Thousand Island is a nostalgic favorite of mine and its creaminess goes well with the fried chicken. Whatever dressing you use, do not “drown” your salad; use only enough to just coat the leaves. Prepare the chicken for frying by seasoning liberally with salt, pepper, garlic powder, and Old Bay. Beat the eggs and add the hot sauce. Add seasoned chicken to egg mixture and set aside. Heat 1/2 inch of oil or lard in a cast iron or enameled dutch oven or skillet over medium heat to 350 degrees. 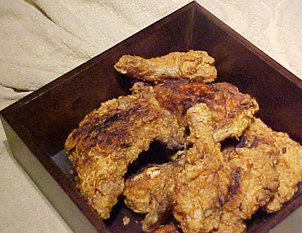 Dredge chicken strips in flour, then fry in batches, taking care not to overcrowd. 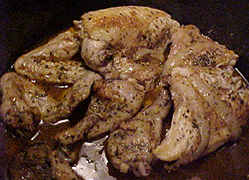 Turn chicken after about 5 minutes; remove when golden brown. Drain fried chicken strips on paper towels. Combine salad ingredients with just enough dressing to coat, a pinch of salt and three or four grindings of black pepper. Toss well and arrange on plates. Place chicken strips on top and serve. Makes 2 entree salads. 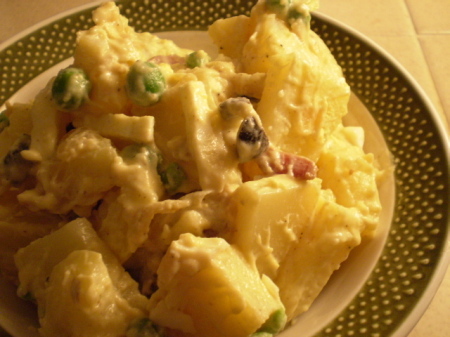 Combine all ingredients in a bowl and let sit for ten minutes before serving.